In the spirit of Halloween I wanted to update my Carrie Tutu post. I've made thousands of these over the years for many brides and SATC fans. This happened to be one of the first DIYs I did for Lauren Conrad. ''People had reservations about the tutu in the opening sequence,'' Sarah Jessica Parker told EW in 2003. But she and costume designer Patricia Field ''stuck to our guns.'' 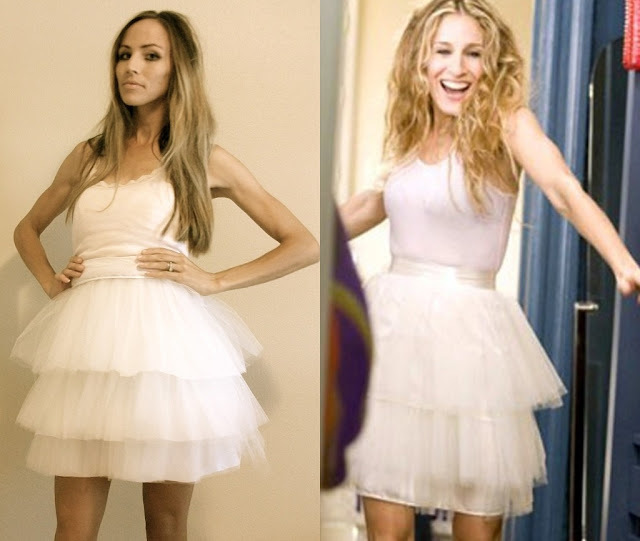 And so it was that even before her first scene, Carrie Bradshaw and her $5 vintage tulle skirt became an instant fashion classic. Fittingly, the tutu, from Parker's personal collection, makes a cameo in the movie." Here is the tutorial post I did for Lauren Conrad's website. So fabulous!!! Congrats on your guest post, etc. Love the dress. Love everything! Hi my name is Kelli and for halloween I'm thinking that I want to be Barbie, but I'm not sure on what to wear. Do you have any ideas? Do you by any chance would be able to sell this? wow you are so talented! wow...you are such a great desaigner. You and the dress have upstaged SJP. Both are much more beautiful than the original. I am lost...where is the tutorial?? You can do elastic, zipper, etc...you will need some sort of closure. Ohh I have loved your blog for some time now! It is the envy of every DIY-er out there. Me included!!! This would be the BEST halloween costume!! Keep posting! Unfortunately, I think this was probably just listed as a DIY tutorial on Pintrest by someone else when they pinned it. Too bad, it's really cute. It's such a nice skirt, thank you so much for posting the instructions on Lauren's website. How can I finish the skirt to have an opening at the back which does not require to attach the tule to the lining? Or do I always need to attach at least 10cm for a zipper and then leave the rest of the tule not attached? Hope this makes sense and look forward to hearing from you.